Have a question? Need advice? Require a second opinion? Ask Grave Matters. Each week, Grave Matters will answer questions submitted by you, the visitors of The Barrow-Downs. Our staff will take your e-mails and give them directly to characters from Middle-earth. Eevry two weeks we will publish a few of the questions received. Grave Matters is not the place to ask direct questions about Middle-earth. We have an Encyclopedia and a Discussion Forum for that. Grave Matters is designed for you to have people from Middle-earth answer questions that concern you personally, or things that you just can�t figure out. You can ask anything, really, so long as it�s not too rude and crude. 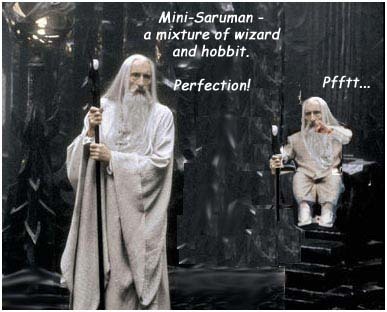 Remember, we�ll be giving them to personalities from Middle-earth, so you�ll want to be polite. And don�t ask for a specific character to answer your questions. We never know who will be available. Sorry, we're not taking new letters at the moment. Preferably, you�ll only send one or two a week. If you have more than that, you need to seek counseling! If you are already in counseling, you may ask three questions. "My sister told me that I will never find a boyfriend so I am considering stealing hers. Is this wrong? vengeance seeker"
WHAT�S THE CHANCE MY QUESTION WILL BE ANSWERED? We�ll only publish three or four answers every two weeks, and we won�t be e-mailing answers, so chance may be slim that yours will be seen. But that doesn�t mean you shouldn�t ask. Someday, you may be pleasantly surprised to see your query posted on the site, and the questions that others ask may be pertinent to your life. So send in your question!